Choosing the right eye cream for your age and skin type. Choosing the right eye cream for your age and skin type. The eye area has the thinnest skin on your face; worse, it also has the fewest oil glands. This dry, thin skin tends to age quicker and many of us see the first sign of aging around the eyes. And while those lines might be a blueprint to your character—your warmth and humor—you don’t necessarily want them there! Fortunately, there’s a lot that you can do to treat and prevent aging around the eyes. It starts with finding the very best anti aging eye cream for your specific needs. Starting early is the best defense against crow’s feet and other signs of aging near the eyes. Young women should look for a light, gel-based eye treatment. It’s important to start young with smoothing fine lines and keeping the area as hydrated as possible. Even better, a gel can be refrigerated to counteract puffiness after a long night out! Your skin gets drier with age. At some point, it’s important to switch to an eye cream with ingredients that pack a little more punch (like Vitamin C, Hyaluronic Acid, or Glycolic Acid). For seriously dry skin, you may want to try a super-moisturizing eye cream at night and switch to a lighter product during the day. Our Olive Eye Cream, for example, is super-rich for seriously dry skin. Try using this at night and switching it up in the a.m.
Ceramide Eye Gel for women in their twenties and thirties. Those of you who are interested in using a Vitamin C eye cream should give our Ceramide Herbal Eye Cream a try (It’s a bit balmier than the Hyaluronic Eye Cream). 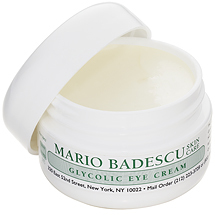 Glycolic Eye Cream is a serious product for those with very mature skin that is already showing obvious signs of aging. Use this at night for repair and switch to a different eye cream in the morning (glycolic acid can cause sensitivity to the sun!). Is extreme dryness your problem? Again, check out the Olive Eye Cream. Tell us, how do you decide which is the best anti-aging eye cream for your skin? Which is your favorite eye cream from Mario Badescu? I am in my early 30’s and have the Special V eye cream. I am not sure if it is the best for me – I have acne prone combination skin and my eyes are very sensitive. They tear at the drop of a hat, and sometime the skin right on my cheek bone (where the eye cream winds up running) breaks out. Do I have the right product? Should I switch? I am an avid Mario user on a regiment and want to make sure I get it right! I have been a long-time fan of MB. I used to use the ceramide eye cream and glycolic eye cream when I was in my 20s and early 30s. I am 36 have NO wrinkles around my eyes, nope, not one single crinkle. I got diagnosed with Sjoergens Syndrom at 35 and this leaves me with REALLY dry eyes (including the skin area around the eyes). The ONLY product that works for me, and trust me, I’ve tried all of them— from La Mer, La Prairie, Chanel to Ponds— is the MB’s Dermonctin eye cream!! I moved to New Zealand 2 yrs ago now, but I love the eye cream so much I have my friends and family bring some back every time they come to visit!!! I also use the ceramide eye gel which I keep in the fridge for days after I’ve had a few cocktails— it works! Love MB!! Fine way of describing, and nice article to obtain facts on the topic of my presentation focus, which i am going to convey in university.